Transformers: Lost Light #23 review – AiPT! The final battle is here! Bots will live, bots will die, and the craziness can only increase! After last issue‘s big last page reveal I imagine that most Transformers: Lost Light readers have been eagerly counting down the days until issue #23. Well, the wait is over. Now we need to know if it lives up to the expectations. This issue of Lost Light reminds me of a magician revealing his tricks. James Roberts plays off so many references, concepts and past events that this feels like the end of a 6 year-long con. One of the reveals, a line from issue 1 of Lost Light‘s predecessor More Than Meets The Eye (MTMTE), is really obvious in hindsight and yet extremely satisfying at the same time. The way he uses the Primal sacrament, introduced back in 2012, is the move of a story-teller who knows how to play the long game and use it to play with the readers’ assumptions. As someone who feared that the story was getting rushed due to the series’ slightly premature end it’s satisfying to see that the reveal of Rung being Primus was seemingly planned from day one. On the topic of that reveal, I knew that there had to be something special about Rung but I didn’t expect that. I also appreciate how many inexplicable plot points or unexplained mysteries are solved in this issue. Whirl focuses on the most important part of last issue’s big reveal. The fear with an issue like this is that it would become dry and heavy with plot reveals, call backs and exposition. This is alleviated through the use of action and humour. The constant, imminent threat of Primus (well, giant Primus) and a short but satisfying fight scene, featuring a great call back to MTMTE #19, provide the action. The humour is more of the silly character driven comedy that made Lost Light & MTMTE one of my favourite series in recent years. Whirl has been one of my favourite MTMTE characters for years and the line “I strangled God” had me cackling as it is just so typical of Whirl. Of course, the writer is only part of the puzzle of comics. The art is just as important, if not more so, and Jack Lawrence deserves a lot of credit here. His depiction of Primus looks great, he nails the facial expressions throughout the issue and the main fight scene is very visceral and clear despite it being quite short. One of my favourite pieces is a half page panel where Lawrence draws over 30 characters, managing to tell multiple side stories — including a touching reunion without using any of the scene’s dialogue. It’s one of those panels where you want to blow it up or use a magnifying glass to look at all the details. Lawrence really found his groove on Lost Light so it’s a shame that the series is ending. I hope that he gets more opportunities in any future Transformers series. Joanna Lafuente’s colouring continues to tie together the myriad of artists who have been drawing Lost Light in the last year. In a reference heavy issue, Lafuente’s explosion colouring really makes the action pop. I don’t always call out letterers but Tom B. Long’s work on Epistemus deserves recognition as it does a really good job of conveying the essence of what is essentially a ball on a chain. 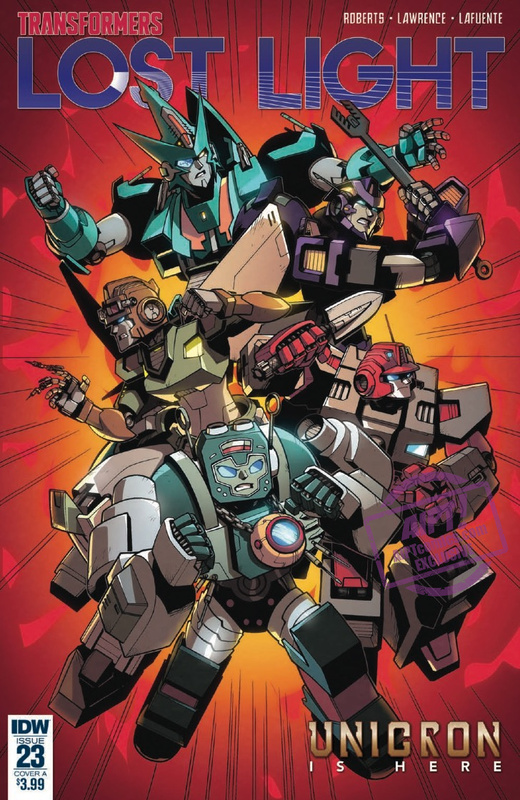 Transformers: Lost Light #23 is Roberts gleefully pulling back the curtain and revealing many of the hints that he has planted throughout his run in the IDW Transformers comics. Despite focusing so much on past events everyone does a great job of preventing the book from feeling slowly or clunky. My only criticisms are that it's slightly, yet understandably, rushed. Not that I care too much about that, I just want to see what Roberts has up his sleeve next. James Roberts has fun pulling back the curtain on 6 years worth of hints and secrets. The book is still funny and exciting despite having so many references. Jack Lawrence saves some of his best work for the end of the series. There may be too many call backs and references for newer fans.